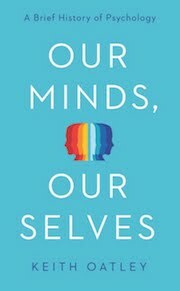 This is the second post in the series by psychologists who are novelists. 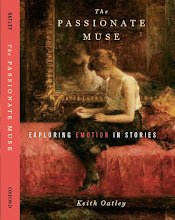 We are asking such people to write a post for us on the relationship of their psychology to their writing of fiction. 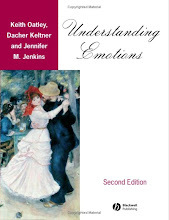 The first in this series was by Elaine Hatfield (click here) a well known social psychologist and researcher on emotions who, with her husband, Richard Rapson, has written six novels. 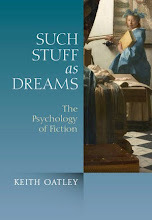 Anyone who is a psychologist who writes fiction, or a knows of such a person who might be good for us to approach, please get in touch with Keith Oatley (e-mail in my Profile). Today we are posting the second such piece, by clinical psychologist, Noam Shpanser, whose novel The good psychologist has just been published. It's about a psychologist who leads a solitary life, and starts to treat a stripper who has panic attacks that prevent her from performing. The good psychologist's detachment starts to break down. 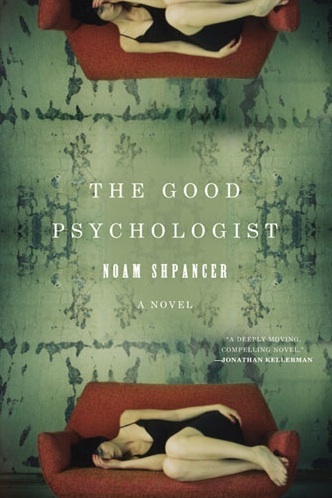 The novel has a very nice endorsement by Jonathan Kellerman: "Noam Shpancer portrays the oft-hidden world of psychotherapy with unparalleled authenticity, compassion, and wit . . . An astonishing debut." Here is his piece for us. For me, being a psychologist has to do with a curiosity about the internal human architecture. My fiction is propelled by the same curiosity. I think the work of a clinician is quite similar to that of a novelist, in several ways. First, therapy is in part about mending narratives. Troubled people are those who have lost the thread of their story. The work of therapy is to create a narrative that sets the events of their lives in a coherent order and creates a space within which they can thrive. When you write a novel, your job is to find the right path for the story, the right structure, order, and pace, so that it can thrive. Second, therapy involves paying attention to several levels of experience at once. You listen to what the person is saying, the content, but also to how they’re saying it—the process. Small nuances of expression matter a lot. The process of writing is quite similar. You have to pay attention to the words, but also to the music. Third, writing involves both conscious and unconscious movements. There’s conscious work of thinking about the plot, the characters. There’s a lot of carpentry, of effortful problem solving. But then there’s also the unconscious work. The deep core of the story resides in the unconscious, and you need to go there and listen, let the story tell itself. This is the most pleasurable aspect of writing, when the characters begin to live on their own, and you shift from inventing to reporting. Writing feels effortless when that happens. And it’s a sign that the story has a life. If you have to force yourself, to make stuff up, you’re wasting your time; it’s like making love to someone you despise. Picasso once said “I don’t search. I find.” That’s the place you want to get to, where you find without searching. This is true in therapy as well. You have to have a conscious plan, a direction, and a structure for your work. And you have to remain mindful of that. But in the therapy encounter, you need to go with the flow of the moment, the living dialogue with the client. The best therapeutic moments happen when you stop trying to do therapy.